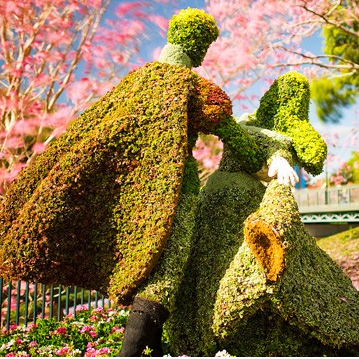 While it may be winter in most places, Epcot Center at Walt Disney World has been preparing for their spring event- The Epcot International Flower and Garden Festival. This special event runs mostly weekends from March 7th, 2014 through May 18th, 2014. While you might not be a huge fan of flowers and gardening, the event has a lot of offer even non-garderny type folks. Amazing topaires, Special events and it's own concert series. This year again boasts over 100 specialty floral designs of both popular Disney characters but also designs themed on each country of World Showcase. Along with this the event has returned the popular outdoor food pavilions, much like the popular "Food and Wine" festival with special dishes. The two biggest draws are the Concert Series and the Appearance by HGTV stars. We've got the full list of both down below!